MEMS is a new conception of therapy, which assures well-being preventing the heavy metabolic diseases. A-144 is the first MEMS produced on the Axanton technology platform, specialized in deactivation of the CM-IDS responsible for cell degeneration. A-144 is the first MEMS produced on the Axanton Technology platform, specialized in deactivation of the CM-IDS responsible for cell membranes signaling to degeneration. Pathologies in aging or infection are associated with cell degeneration. The degenerative process leads in its late stage to heavy handicaps, requiring transplantation of the cells or organs. The cell degeneration is the main process in most aging-associated diseases: glaucoma, retinal degeneration, cardiovascular diseases, pulmonary hypertension, liver degeneration, osteoporosis, depression, Parkinson's, Alzheimer's. This first developed MEMS, A-144, stops the degeneration of the cells. 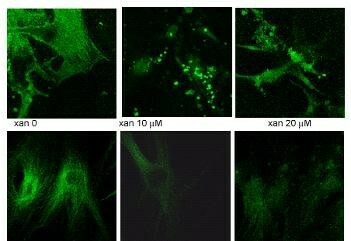 Xanthurenic acid abolishes calcium binding in the cell. A-144 rescues calcium binding. A-144 targets cellular degeneration market, the main process in most aging-associated diseases and infections. Twenty percent of the population has aging -associated diseases. Those people need to take A-144, to deactivate existing modified proteins, and permitting native immune system to eliminate them. A weekly oral dose of five micrograms protects the host against invasive surgery and handicap. A-144 is the first of the new line of drugs able to regenerate cells in situ. There are many players on the market of the degenerative diseases associated with aging. However, the existing drugs target the symptoms of the diseases, with relative success, and many side effects. MEMS A-144 targets the upstream causes of the diseases, stopping the process of degeneration, which leads to the terminal degeneration of organs.